Ok, so it’s not that little, but it fits. And it fits kinda well to say there’s not modifications to the pattern since printing it. So I’m fairly pleased. Thanks for your help in deciding whether or not the Liberty bias trim should be hidden or on show. 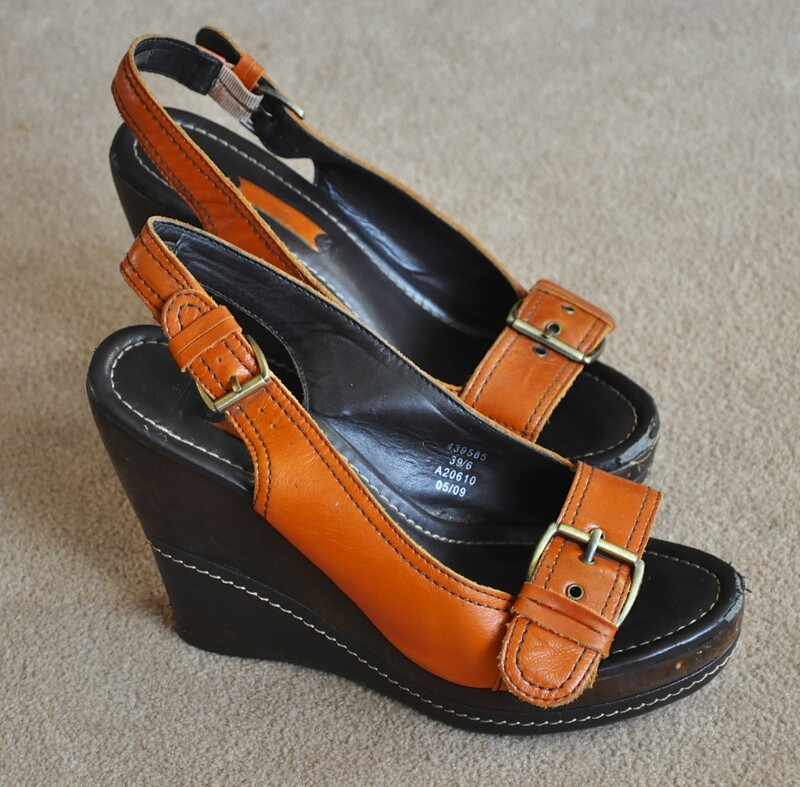 Hidden won – mainly so I can wear my orange wedges (my favourites) and dress it up if needed. 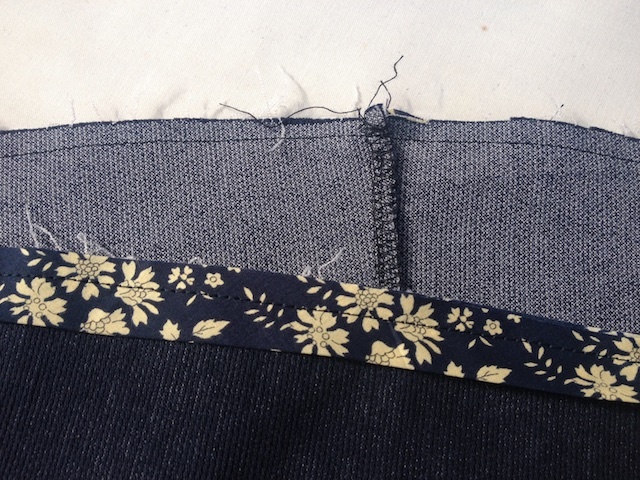 The trim was simple and I added it to all raw edges including the hem. Here’s a few photos of how I did it in case you’re interested. I used single folded bias binding (home made!). Before pressing it was just less than 1 1/2 inches wide. I stitched it to the right side with a 3/8 inch seam allowance. 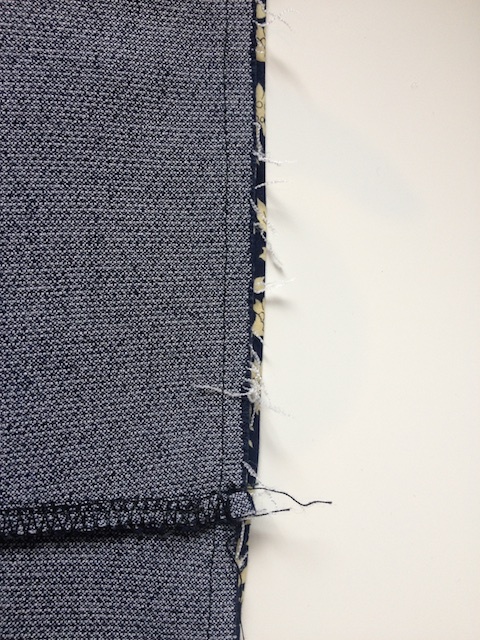 It needs to be less than what is left of the bias trim than will be turned to the inside. 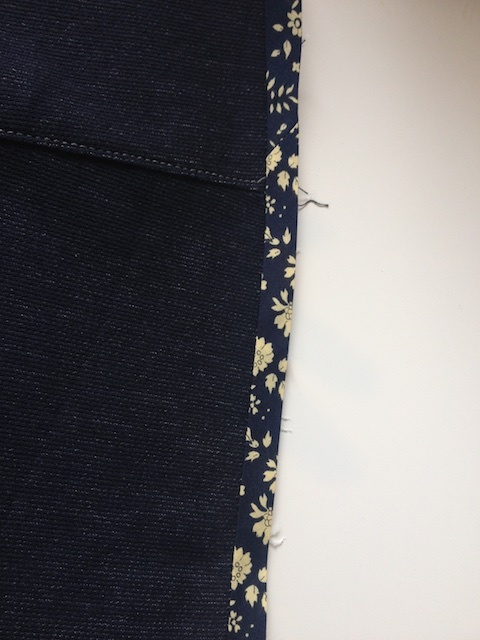 I pressed the bias tape on the hem but didn’t bother on any of the other edges and it made no difference. It probably looks worse at the hem looks to have stretched out a little. So next time I won’t bother. There were lots of little threads. So I snipped them off with the nail scissors – I’ve learned my lesson the hard way using big scissors for a little job. Note to self. Must by some embroidery scissors! 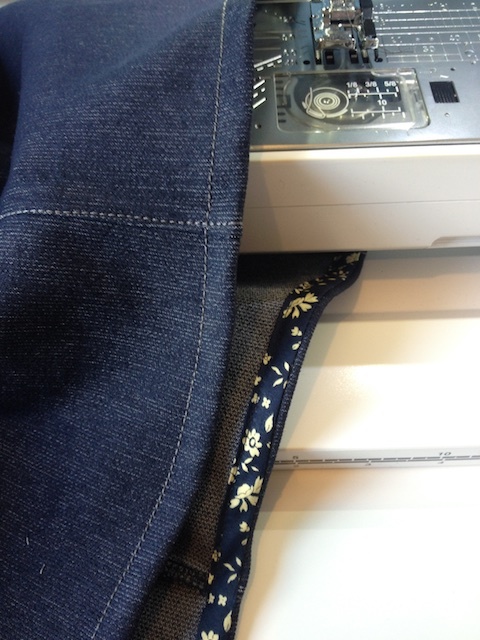 As per my new Janet Pray Craftsy Class I didn’t bother with pins, I just turned and sewed! It worked. I didn’t even bother practising, just got on with it. I did the same on all the rest of the raw edges of the dress. 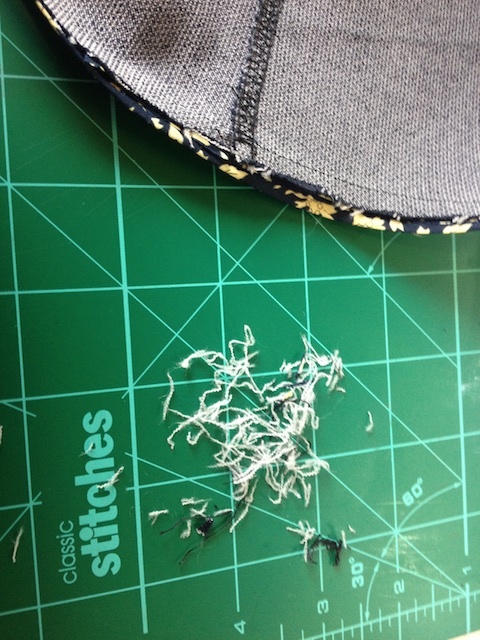 I then edge stitched all edges too, as close as I dare go. About 1-2 mm with the special edge stitching foot. I should really have done a better close up! And excuse my underwear – I thought something magical would happen when I put on the little black number from M&S underneath but it didn’t! When I came to take some pictures I had a bit of a problem. The bit that should be on the top of my tripod that makes it fasten to my camera was missing. (I bought a tripod a few years ago so I could photograph a firework display – honest!). So I improvised and rested it on the toaster and a shelf in the kitchen. Looking at the photo above it looks like a sway back adjustment is needed. But in real life I don’t think it matters. especially for a denim casual sort of dress that at the best is gonna be worn with wedges and spotted drinking lattes in a garden centre cafe! 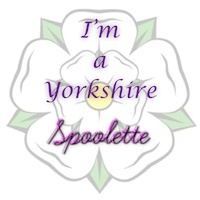 Or if it’s really lucky, on a Spoolette meet up! And if I am bothered one day, i can always put my Victoria Blazer on over it! (excuse the mess – Harrison’s back, along with a suitcase full of smelly clothes!). So, just one question before you go. Is Lekala a cheats way of making clothes that fit? Or is it a bit of a miracle for those of us who don’t want to spend hours tissue fitting, muslinning, and have a more challenging body shape!? Either way, you still have to know what you’re doing with a machine. The instructions aren’t too descriptive and there’s no diagrams or sewalongs to help you on your way. Just wondered……..
Oh, just a little foot note……the orange shoes! I’ve had these quite a few years. If they could type they could write a great blog! They’ve had new heals and soles and now on close inspection need some attention on their front end, I still love them and wish I’d bought them in green too! C’mon, let’s see that renfrew before the months out! Appreciate your care with patterns. Is pattern copying paper readily available there? It isn’t over here, with many (or most?) fabric stores never having heard of it. Grease proof papers same. We get it not grease proof too, which I find better as the grease proof doesn’t like being taped together! Ah! Guess that’s true about the tape factor. 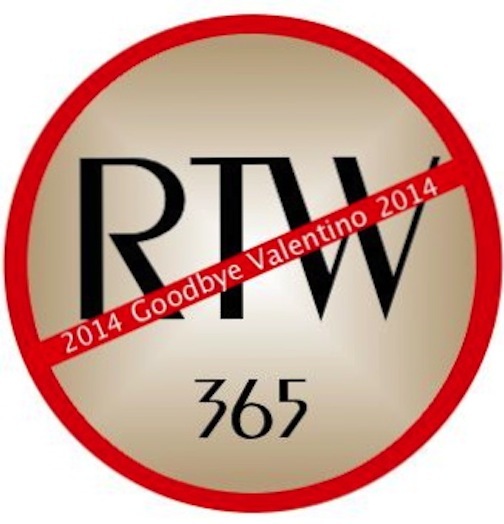 Hadn’t realized – thank you! Whoops ~ just realize that’s what’s sort of holding up my process just now. Should be re-drawing this pattern. Thank you! Fab dress! The fit looks great to me, and how nice does it look with your bright Victoria blazer? Nice work! 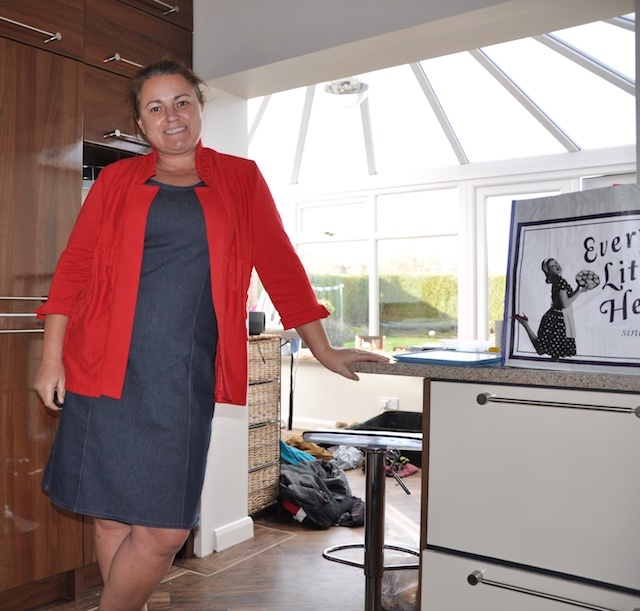 Yea, I’m loving the blazer with it – that was a Dewsbury bargain – £2 a metre! That shops closed down now, probably went bankrupt ‘giving away’ their fabric! That does fit you so well! Yay! I’m glad you are not bothered by the back wrinkle. I think it the overall fit is great and do not worry a bit about that. And I know you could not have taken my bias binding vote into account since mine was so late, but I think you made the right choice because you must always, ALWAYS consider shoes! So why didn’t we get a pic of the beloved orange wedges with your cute dress? Pic of shoes now added – unfortunately not with the dress. I ended up wearing some different ones as I didn’t want to break my neck whilst looking after our guests today! They are cute! Worth making sure the dress matches, certainly! Such a cute, casual dress! Can’t wait to see it with the shoes ;-). This is a lovely dress! After your recommendation I’m going to give Lekala a go but they have so many patterns to choose from! 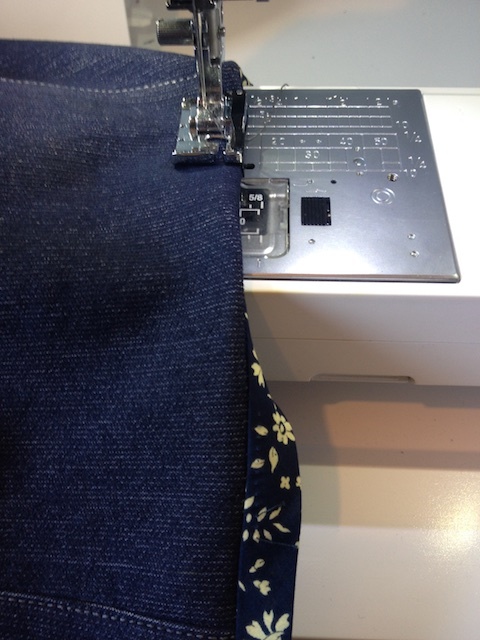 There’s a few free ones to try but don’t forget to add seam allowances, unless you want to do it Burda style! You’ve to pay about 50p for seam allowances to be included…strange but true! Have fun! Great dress! What a wardrobe staple! The dress turned out beautifully and you look fabulous darling! Don’t forget a pocket for the ☀️👓’s! Very nice! I’ve been contemplating looking at some Lekala patterns, found the website slightly overwhelming for some reason but this is lovely so feeling inspired to have another go! I spend ages looking at their patterns, some of the garments are a bit odd looking, but every once in a while one jumps out at me and I’ll give it a whirl! I’m contemplating buying a trouser pattern next. Thanks! I does need tweaking in places a little bit, but nothing like what I find with other ‘normal’ patterns. Looks good! 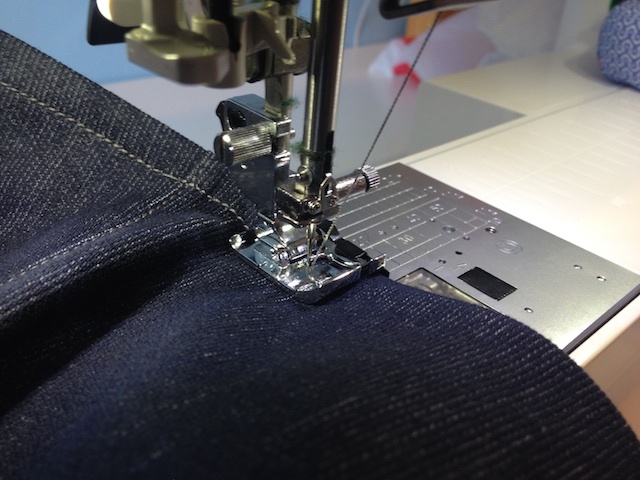 And you know I love topstitching! Very clever making your own bias tape. I don’t think it is cheating to buy a pattern that fits… It’s nice that they are out there! Thanks! I love finding fabric and making my own bias tape to match. And then I just make a little bit extra for just in case! Oh looks so fab!!! Yes, definitely wear on next meet up! Excellent top stitching too! 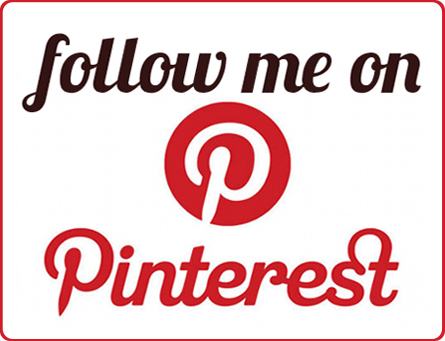 I have used a few lekala patterns, but keep getting free ones from sewing mags and so have been using those instead! I find them free ones with the mags aren’t quite big enough for my top half – cos of my broad back, not cos I’ve got huge knockers, lol!! Maybe the odd Ruby or two…..? 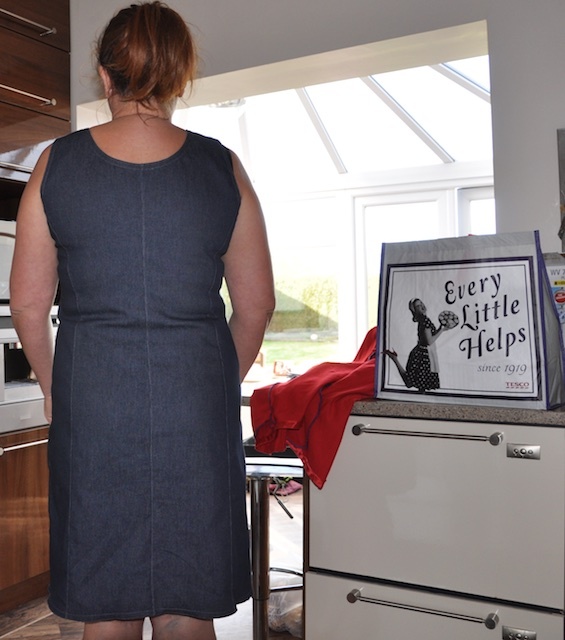 And thirty Lottie blouses later………..
You look lovely in your dress. Great job! I shall have to try Lekala. That is a cute dress! Thankyou! They’re definitely worth a look. I tried a couple of the free ones first to get a hang of them, before I splashed out £2 something!! It’s strange how on unusual colour of boot/shoe can somehow go with anything! Last year when I was on the RTW fast I think I bought more shoes than I normally would to make up for not buying clothes! Looks great. I can see you getting a a lot of wear out of this one. You’ve lost several stone since that drapey number!